This is a super quick recipe that is both different and tasty. A fun recipe to add some green leafy veggies to your meal. Wash and roughly chop the spinach leaves. Set aside. Chop the green chili finely. Crush the garlic cloves. Set aside. In a bowl, mix 1 cup water with gram flour and mix well. Set aside. Heat oil in a pan. Add cumin seeds, mustard seeds, asafoetida and turmeric powder. Once the seeds crackle, add green chili and garlic. Give a quick mix. Add the gram flour mixture, salt, garam masala, sugar and lemon juice. Add the spinach leaves. Mix well and cook it on medium heat for 2-3 minutes. Don't overcook the spinach. It tastes best when the leaves still have a little crunch in them. 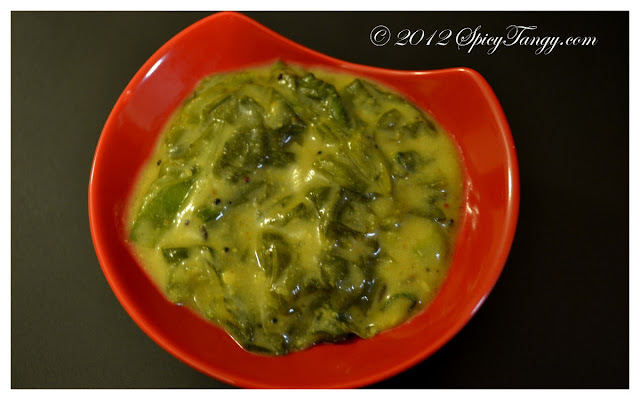 You may make this curry with any other green leafy vegetable of your choice.